Each Monday Cathy at Rambling In The Garden invites us to share an arrangement assembled from materials collected in our gardens. I love daylight saving time but the time shift yesterday brought an extra hour of early morning enjoyment. The ground was covered with a very light first frost that quickly disappeared. 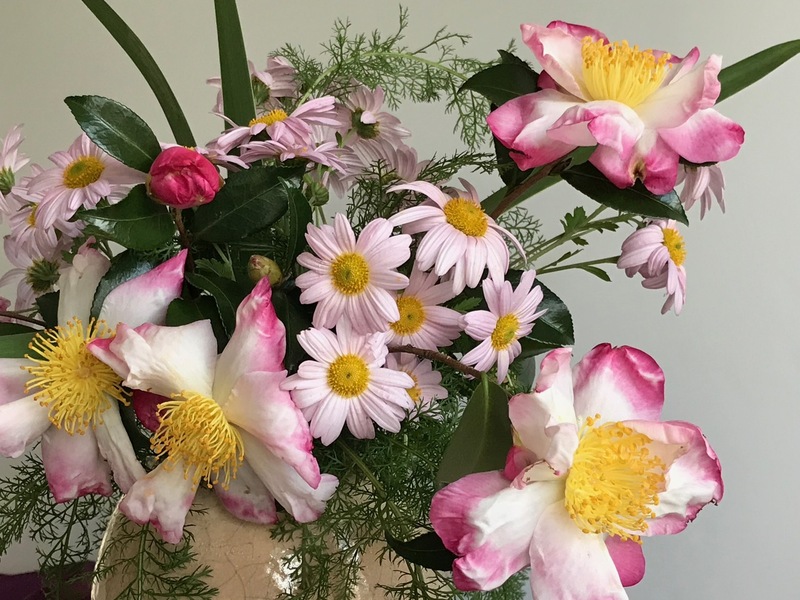 I used the time to gather chrysanthemums and camellias for today’s vase and place them into water for conditioning, before heading off to teach my weekly Gentle Yoga class. Both these flowers have been blossoming for several weeks. Wishing I had used some Oasis to help keep the stems in position, I went round and round inserting, removing and re-inserting these flowers until it was simply time to stop and appreciate the gift of fresh blooms in November. The sasanqua has a light, but sweet fragrance that makes it all the more enticing. 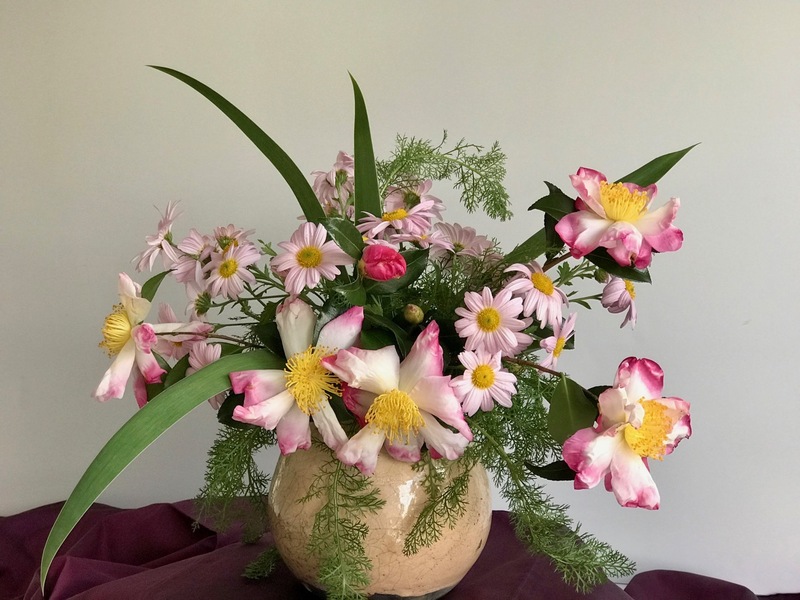 This entry was posted in garden and tagged 2018vase, autumn blooms, Camellia sasanqua 'Hana-Jiman', Chrysanthemum 'Sheffield Pink' (Hardy Chrysanthemum) on November 5, 2018 by pbmgarden. These dark days of autumn are certainly improved by a lovely colourful vase of flowers. Thanks Christina. Didn’t find a vase from you today. Hope you’re off enjoying something exciting. Just busy. It was the first rain free day for ages and I just had to get into the garden. Maybe a vase today! Perfect pinks with a great scent. I’m enjoying the scents of camellias here too, no frost yet. The scent of this camellia has caught me off-guard multiple times today. Loving it. It’s turned warm and stormy here today. What a beautiful combination and so fresh with those pastel colors. Most of the color up here is relegated to leaves as the garden is definitely on the downside. Overnight lows in the 20s this coming week which is more than a little depressing. Thanks Linda. Pastel in autumn is a little strange but I’m happy for the blooms anyway. Autumn is definitely a good time to focus on leaves. I’d actually planned to use some but upon closer examination they weren’t in very good condition. Bundle up and know spring will return! Sorry I had trouble leaving a comment on your post Amanda, but your pink is lovely. Nice to spot something perfect for a vase. 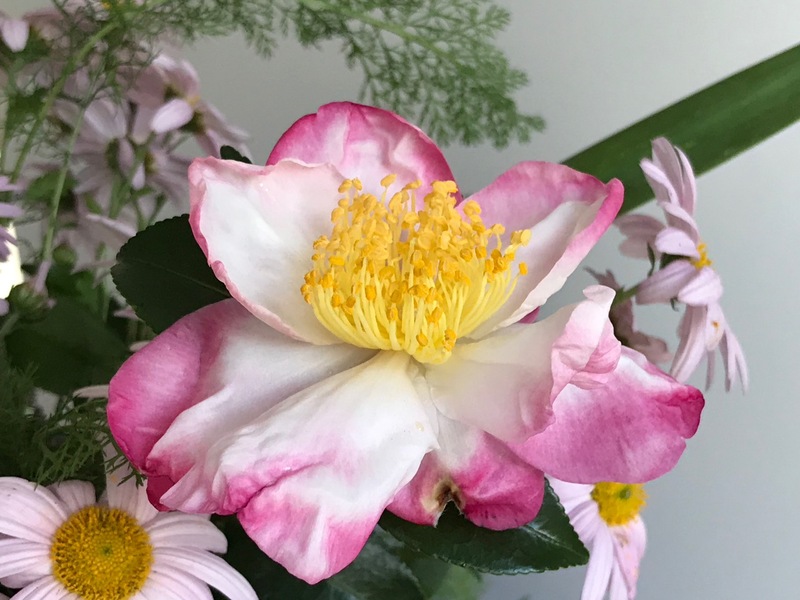 The colours on that Camellia are a delight and so pretty with the Chrysanthemum. Thank you Alison. I have very little left blooming now so these pink flowers have to play nice together. What a treat to have such fresh and happy looking blooms in your garden in November. Oasis or not, your arrangement is lovely. I’ve given up on growing chrysanthemums here because, although they’re hardy in our climate, the blooms often get so wet and mushy in our wet autumns that the joy of their blooms is very short lived; yours look wonderful! Thanks Peter. This is a particularly good chrysanthemum that I admired in my neighborhood for years and finally scored some a couple years ago. I have another that gets too tall and splays over but I keep it for sentimental reasons. Hana-Jiman was a variety that we grew back in the 1990s. Because we just grew the plants, we did not see them bloom much. They were in a retail nursery somewhere by the time they got that pretty. Only the stock plants that gave us the cuttings bloomed, mostly later in the season. Thanks for the info on Hana-Jiman. I like its crisp, crinkly texture and fragrance. Thanks Cathy. Raku pottery is so compelling. I love it. Sheffield Pink came to me as a passalong. Don’t know how readily available it is to buy, but all my neighbors seemed to have a bit. I love these soft pinks, Susie. Your use of the Iris leaves does a great job of adding volume while also giving the arrangement an airy feel. 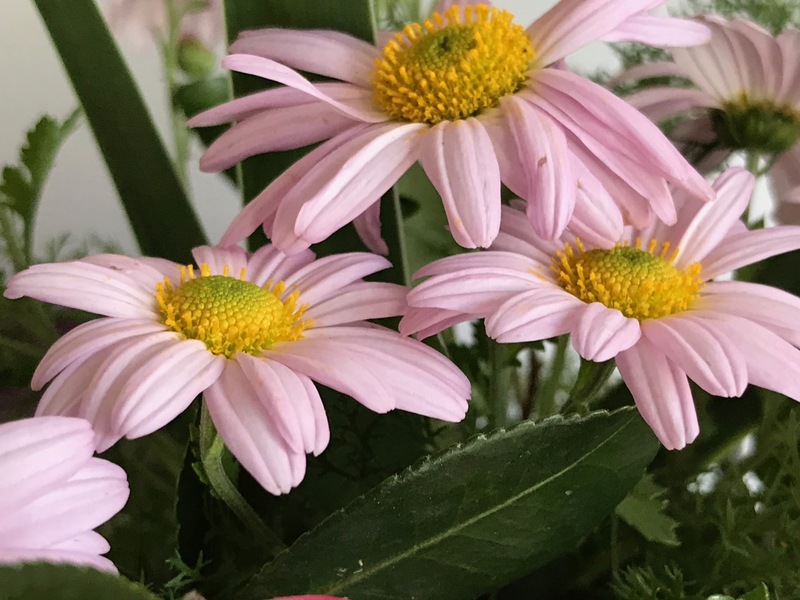 I need to learn from you there as I still tend to cram too much in a vase, not allowing each bloom to be admired on its own as well as part of a composition as you do. I hope the yoga classes are going well. A class in gentle yoga sounds like just the ticket to me right now. I don’t have as much blooming as you do so it’s impossible for me to overfill a vase with flowers, especially now. But I do know what you mean. I learned in a floral design class to allow there to be space. I’m really enjoying teaching the yoga classes. Treat yourself to a class around you somewhere but you do have to shop around for the style that suits you. I love the colour of ‘Sheffield Pink’, it’s definitely going on the wants list. And what a perfect match for the fabulous camellia. I’ll look forward to seeing ‘Sheffield Pink’ in your vase one of these days! You found the perfect container to complement these late season beauties. Thanks Ricki, hadn’t used that vase in a while. It’s one I picked up at a street fair probably 35 years ago and have always enjoyed. Very pretty, Susie. That mum is the loveliest shade of pink! The pink mum has been a treat this fall. Last year all the flowers were bug-eaten but this year they’re very healthy. I love the repetition of the yellow centres in the pale pink flowers.